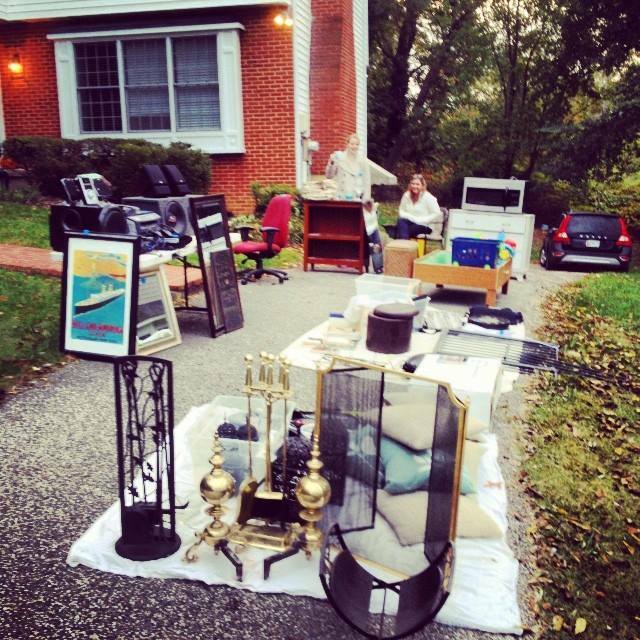 This weekend we had a yard sale, or rather a, “We can no longer walk through our basement-sale”. My friend Colleen was kind enough to come over to our house at 7 AM to make sure we got up. This is the assortment of items we haven’t found a place for since moving: We made a couple hundred dollars, and while we didn’t sell much of the big stuff, we were able to photograph everything and put it on Craigslist, so I would call the yard sale a success. While cleaning out the basement I found a painting I’d been searching for ever since our move. Jason bought it for me on our honeymoon in Barcelona, after taking a trans-Atlantic cruise to Europe via the pathway through hell. I’d been to Europe a few times as a flight attendant, and knew it could be kind of “go-go-go”, so sun-bathing and drinking Pina Coladas for a week after the wedding sounded like a relaxing way to start our three week vacation. Then we walked on the ship and reality hit. The average passenger age was 75, and the first night someone had to be med-evac’d off, so the ship was rerouted North to Nova Scotia. Thus began nine days through the roughest, coldest, foggiest seas ever encountered. It was July, so my wardrobe consisted of little more than suntan lotion, but the average temperature was about 45 degrees. Everyone on the boat was sea-sick, you had to hold onto the walls as you walked down the hallway to keep from falling over from thirty foot waves, and the highlight of our daily activities was a lecture on the history of ship building in a room pea-soup thick with cigarette smoke. The end result was in a bar tab that cost as much as the trip itself, and the conception of our son. The moment we hit land it was pure heaven, but by the last day we were out of cash and couldn’t use our credit cards because European cards have an embedded security chip, so their machines wouldn’t process ours. 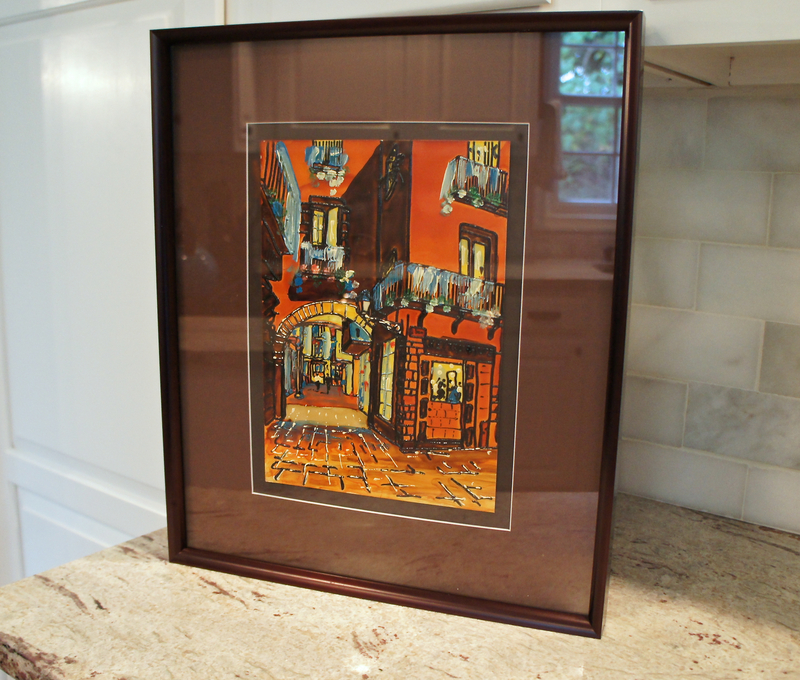 With the very last twenty Euros we had, Jason bought me this painting of an alleyway in Las Ramblas: I’m excited to use it on a gallery wall in our boring dining room. 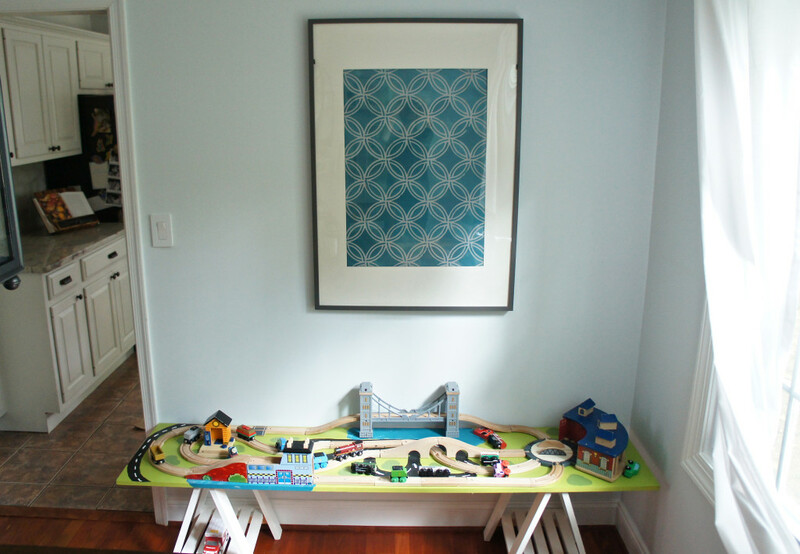 We had a map of Baltimore hanging there, but it was a little too beige, and that room is definitely in need of color. 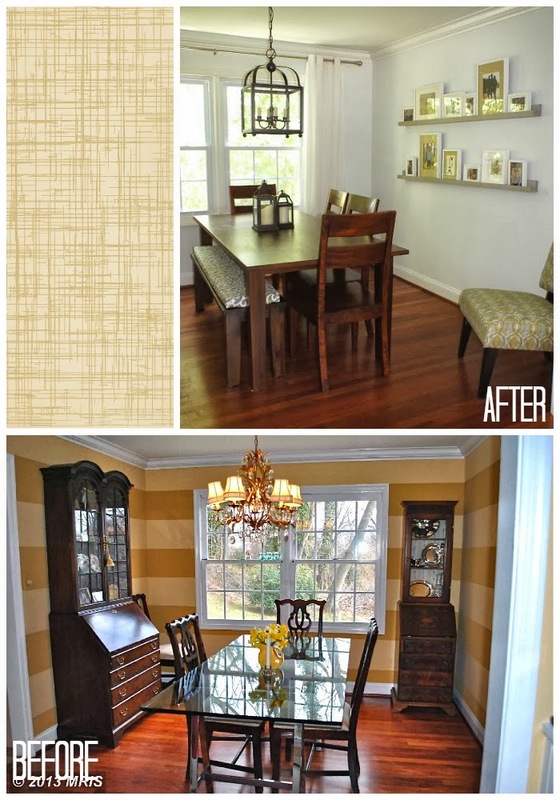 We might have toned it down a little too much: I think the orange stripes overwhelmed us to the point that the only color we found appealing was white. 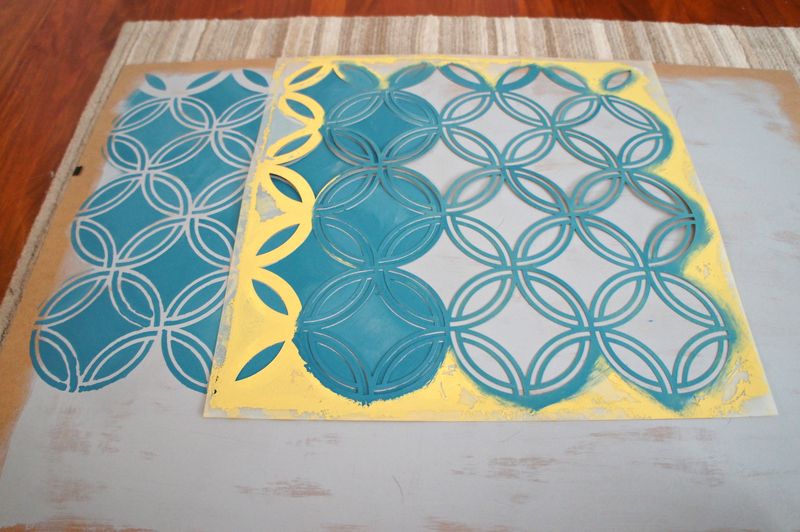 This is the stencil from DIY Stencil shop on Etsy that I used to paint the curtains in Grant’s room . It’s reusable, so I decided to try it out for this project. I painted directly onto the board from the back of the frame. 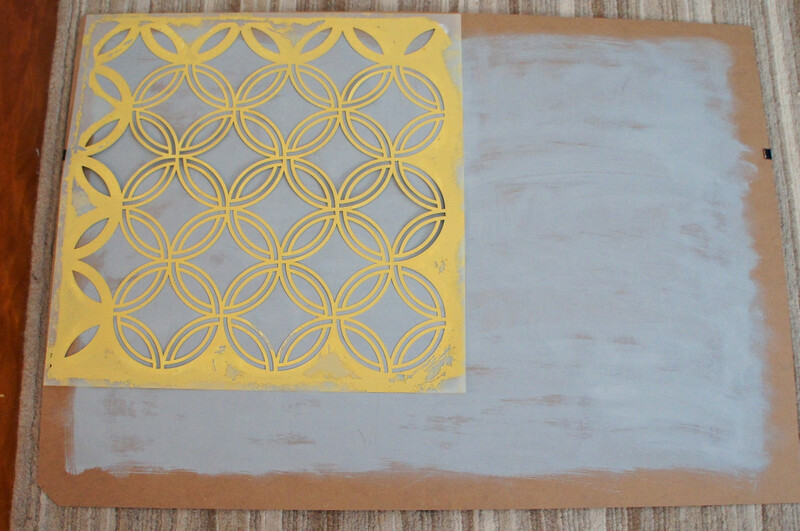 After giving it a light coat of Benjamin Moore’s Covington Grey, I lined up the stencil with the edge of my mat. 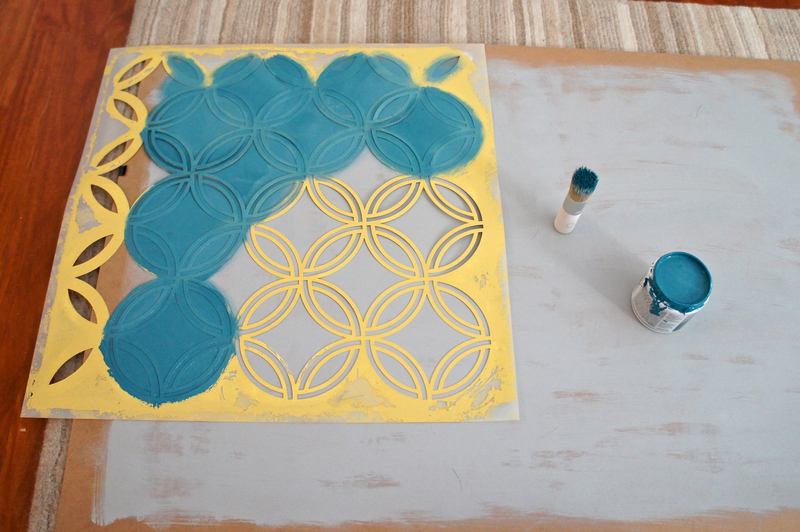 Using a stenciling brush from Michael’s, I dabbed on the paint, which is a mixture of three paint samples I had laying around: It’s important to coat lightly, if there is any paint pooling it will get dragged across when you move the stencil. I immediately peeled it off and moved it over, covering the end of what I’d already painted. Then I made my way around the board. After letting everything dry for an hour, I reframed it: I don’t think the Met is going to be commissioning me for a painting anytime soon, but it’s bright. Tonight we will try to add some other pictures, so hopefully I will have a gallery wall to share tomorrow. For now, someone is cranky and trying to help me type, so I need to get him a snack before he deletes everything on my computer.